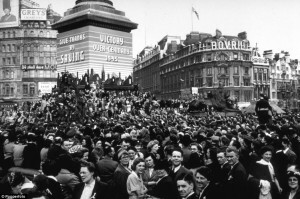 VE day (Victory in Europe day) is held on May 8th. It commemorates the end of the Second World War in Europe, when the forces of Nazi Germany surrendered to the Allied forces. The Japanese continued to fight the Americans until August 15, 1945. This date is known as VJ day (Victory in Japan day). The Second World War lasted 6 years from 1939 to 1945. Sixty million people in Europe, Africa and Asia were killed. On May 7, 1945, the German High Command signed an unconditional surrender document. To give time for the news to spread to the fighting soldiers, it was agreed that the ceasefire should be at 00.01 on the May 9th. However, enthusiastic journalists broke the news early and spontaneous celebrations began almost immediately. In Britain people gathered on the streets, many dressed in red, white and blue, to sing and dance, hugging each other, relieved that the war was finally over. Britain and Western Europe decided to celebrate VE day on the 8th May with street parties and fancy dress parades for the children. In Russia VE day is celebrated on May the 9th, the official date the war ended. Food was rationed, so people had to pool together their coupons to have enough to provide party food. Many of the street party decorations were handmade. Decorations could not be easily bought in war-weary England. Russia and the rest of Eastern Europe stuck to the original agreement and still celebrate on May 9. British Prime Minister Winston Churchill officially announced the surrender of Nazi Germany which was broadcast around the world to British soldiers. He gave thanks to God and then went to join the Royal family on the balcony of Buckingham palace and told the crowds. “This is your victory… Advance Britannia”. 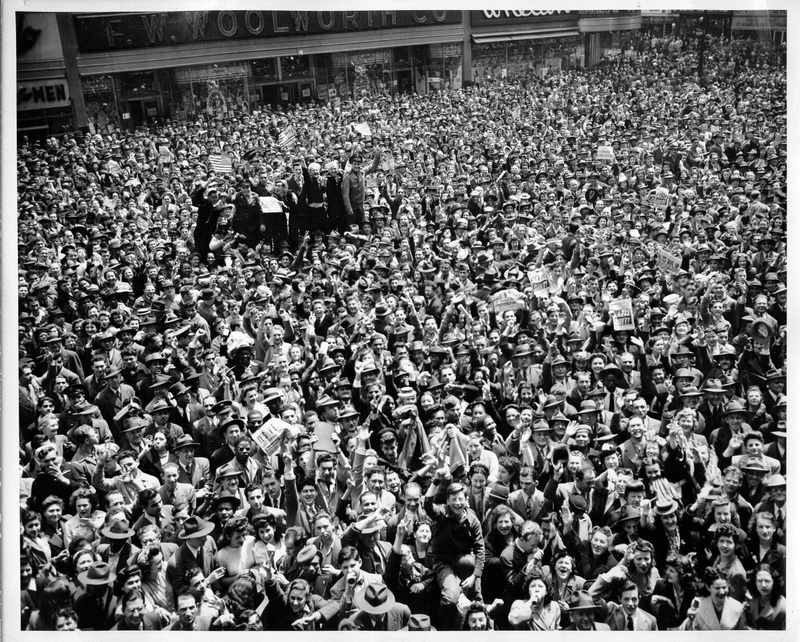 Americans celebrate the Nazi surrender on VE Day in New York City.